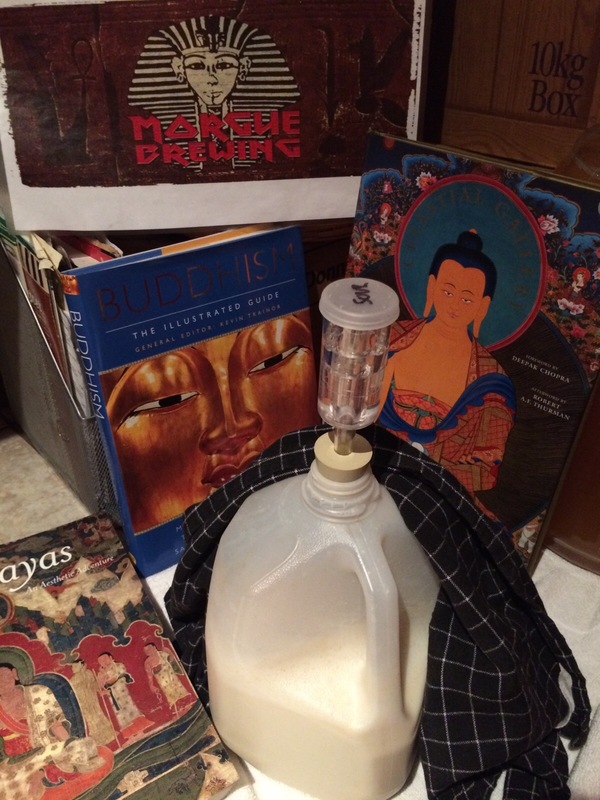 My inauthentic attempt at replicating 14th century Mongolian airag, a lightly fermented drink produced of mare’s milk. 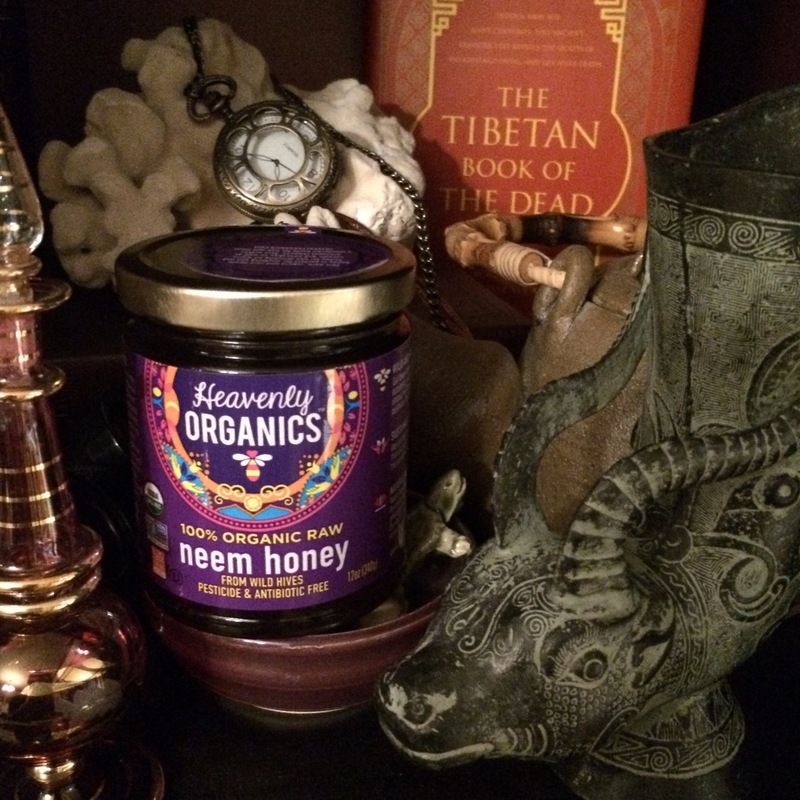 The neem honey is marvelously floral and a little bit spicy. Not spicy hot, but earthy spice. It’s absolutely remarkable and boldly stands out from standard honey. For the one I dared serve, scroll down to 2nd attempt. I think I broke all the brewer’s rules with this batch. Didn’t sanitize the equipment. Didn’t boil the “wort.” Didn’t boil the cardamom. Didn’t pasteurize the honey. No activity 24 hours after pitching yeast. Maybe slow to start. This certainly does not contain the same amount of fermentable sugar as beer wort. Or perhaps I didn’t add enough yeast starter, or that yeast is just dead. Well wait and see. There’s some good activity after 48 hours. Every now and then I remove the airlock and shake the jug a bit with the cap on. (Then I Star-San the cap and set it aside for next time.) I like to think that this replicates the Mongolian tradition where anyone who entered or exited the yurt would give the leather skin of fermenting airag a good couple punches to inhibit clumping. I suspect, however, that I will want to run the airag through a blender when it’s done, much as this Colombian kumis recipe suggests. I’m curious how much the milk is fermenting or if it’s all just the honey. I don’t know if there’s anyway to determine that after-the-fact. The wife says, “Smells like baby vomit.” I’m reluctantly forced to agree. The taste is not substantially better. Connoisseurs use terms such as “baby vomit” and “bandaid” for sour ale in its stages of development. Rule of thumb is to wait it out. Monday, October 3, 2016. Adapted from recipe for Colombian kumis (arguably more so kefir than kumis). I’ll be using my Römertopf, a German clay pot based on the ancient Italic Etruscan clay-cooking method. Hey, the ancients brewed in earthenware all the time. I think the Römertopf will be my go-to, wild, small batch fermenter. 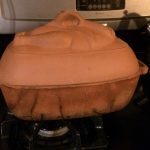 Soak clay pot in hot water. 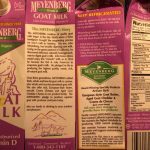 Warm quart organic whole milk. Put in clay pot. Whisk in about tsp organic wildflower honey for kicks. 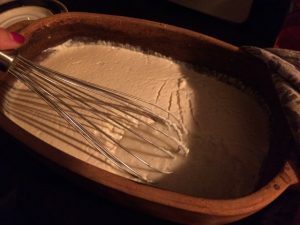 When below 90F, whisk in half cup of plain Greek yogurt. Cover with clay pot’s lid. Set aside for 24 hrs. Oct. 4. After 24 hours, smelled strongly like yogurt and had a mild yogurt taste. Slightly thickened. Whisked. Put in warm oven (maybe 150F and cooling) for an hour. 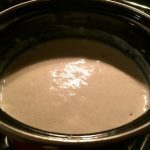 Thickened considerably to yogurt drink consistency. Whisked. Tossed in about 2 fl. oz. reused Belgian Saison yeast and maybe a tbsp corn sugar. Whisked. Put back in room temp oven with clean dish towel cover. Oct. 5. After another 24 hours, tastes like mild yogurt. Imperceptible if any fermentation happening from Saison yeast and corn sugar addition. Added about 3 fl. oz. Côte des Blancs yeast recovered from a batch of hard cider plus less than 1 oz. corn sugar. Oct 8. 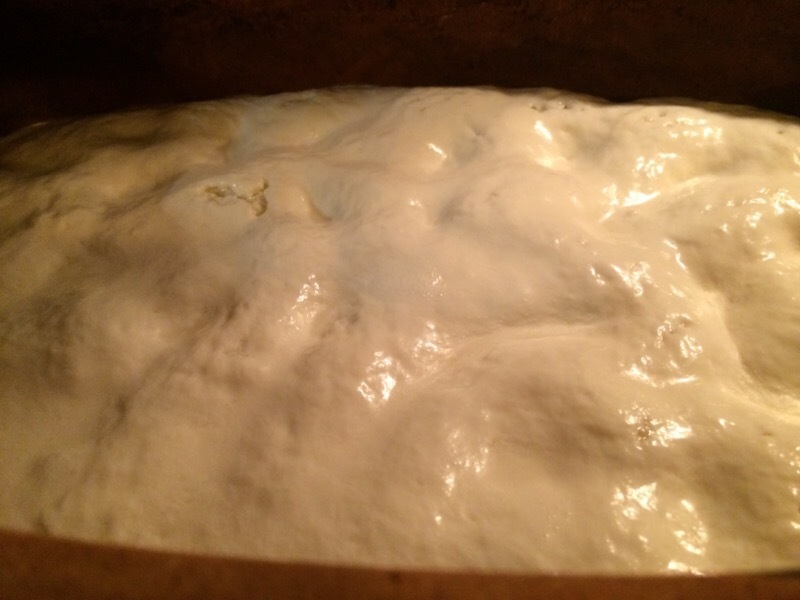 Developed a wonderful bread aroma and a beautiful, thick yogurt yeast head. The head tastes like a creamy Greek yogurt. Not too tart. The body underneath is quite liquid and has a brilliant yogurt-champagne taste. Even a little bit of sparkling mouthfeel possibly from an active fermentation. I don’t know if it’s authentic, but I’m calling it airag! Blended a small taste with honey and cardamom. Magnificent! I most certainly would not feel embarrassed to serve this to acquaintances. Heated on stove in kettle to 177F. Add cardamom and neem honey to taste. Added all of my 4.2 oz neem honey left. Not sure how much cardamom, but it takes a lot. More or less added a light layer and stirred it in. Cool in fridge. Oct 9. Set in fridge overnight. Strained into a bottle, though it was unnecessary to strain, as nothing strained out. Lightly force-carbonated using a carbonator cap. Delicious! The honey and cardamom remain potent. The carbonation gives it a delightful, champagney fizz as though it were still actively fermenting. Next I will simplify the recipe for easier replicability. 1oz corn sugar dissolved in some of the whole milk warmed up a bit. 3oz Côte des Blancs dry white wine yeast reused from a batch of tart cider fermented in my sour carboy. 10/23. 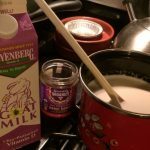 After 2 days, add about an ounce wildflower honey dissolves in about an ounce or so of warm milk. The yeast-yogurt barm is like meringue! 10/24. Separated curds from whey. 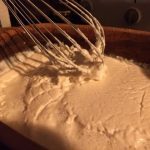 Curds pretty much like bland cottage cheese. Whey is very transparent slightly tangy liquid. To whey I added another ounce wildflower honey warmed with some water and a healthy layer of cardamom. 10/26. Opened bottle and it mega-spewed like shaken champagne. Shame. Smelled clean and effervescent. I managed to save about half and put in fridge. I wouldn’t have guessed it’d be that carbonated. Hopefully it’ll cool its jets. Would be nice it if could reproduce this beverage without the spew effect. 10/24. To the curds from 3rd batch, added 9 fl oz whole milk, 2 oz wildflower honey, healthy dash of cardamom. Not sure how this will be any different. 10/25. In the spirit of “I wonder what this button does,” I tossed in a couple ounces of corn sugar. 10/26. Occasionally stir. Pretty sour. Next year: if memory serves, it was palatable. 7/20/2017. 32oz whole milk and 2 oz corn sugar warmed and added to hot-water soaked clay pot. 1-2 tbsp Greek yogurt whisked in. 7/23. Moved from clay pot to stovetop. Warmed with 4.5oz wildflower and clover honey and 1 tsp cardamom. Returned to clay pot to settle.